Fractures are small cracks that occur in the bones. Your feet and ankles contain one-third of the bones in your entire body also support your full weight which makes them very susceptible to injury leading to pain. Stress from rotational injuries or repeated impact can cause these bones to fracture, leading to pain, swelling, tenderness, and/or bruising. If your feet and ankles are in constant pain and you feel that you may have developed a fracture, it is important to see your podiatrist. Call Dr. Tirone or Dr. DeMaria at the Foot Specialists of Greater Cincinnati at (859) 341-9900. Foot and ankle fractures most commonly affect athletes in a variety of sports but can also affect anyone who is on their feet quite a bit. Athletes often develop fractures from overuse. As the muscles of the feet and ankles become overtired, they are less able to act as shock absorbers. This transfers additional stress to the bones, resulting in fractures. As common as these injuries can be in athletes, they are hardly the only ones who develop these types of fractures. People who don’t exercise can lack bone density, making it easier for them to suffer fractures. These individuals can develop fractures during normal activities like walking, or as a result of a sudden increase in activity. It is important to remember that any new exercise routine should be implemented gradually to reduce the risk of injury. Accidents are also a common cause of fractures in the feet and ankles. Stubbing the toes can result in fractures. Rotational injuries can occur when the side of the toes strikes a solid object, another common cause of fractures. Fractures to the metatarsals can occur as a result of a fall or twisting of the ankle. Following a fracture, the area around the bone will usually be tender and swollen. Pain usually increases with increased levels of activity, especially anything that forces the bone to bear additional weight or pressure (like running or jumping). 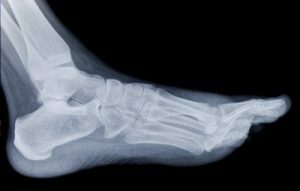 If you suspect you may have fractured a bone in your feet or ankles, you should see a podiatrist to ensure it will heal correctly. Treatment for a foot or ankle fracture will depend upon the location and severity of the injury. Fractures will heal by themselves, but without proper care, they may not heal correctly. As soon as you think you have a fracture, you should cease all strenuous activity. Rest is crucial for your body’s healing process. Apply an ice pack for 15 to 20 minutes at a time and keep your foot elevated above your heart. Anti-inflammatory medicines like ibuprofen can reduce swelling, but these are not recommended as they inhibit the bone from healing. The physicians at the Foot Specialists of Greater Cincinnati may recommend several treatment options for your foot or ankle fracture. Most of the time, protective footwear or a cast will need to be worn for six to eight weeks. During this time, you should avoid putting any weight on the injured foot. Crutches or a wheelchair may be used to help you get around. Shoes with a solid sole or a special fracture brace may be worn to support the fractured foot. If the fracture is on the outside of the foot, a cast is usually applied to immobilize the injured area. In some cases, surgery is necessary to support the fractured bones. In these instances, pins, screws, and/or plates are inserted into the fractured bone to hold it in place. The surgery is usually simple but will require a period of no walking to properly heal. The fifth metatarsal is one bone that has particular difficulty healing on its own. Dislocated toes can be put back into place by the doctor.